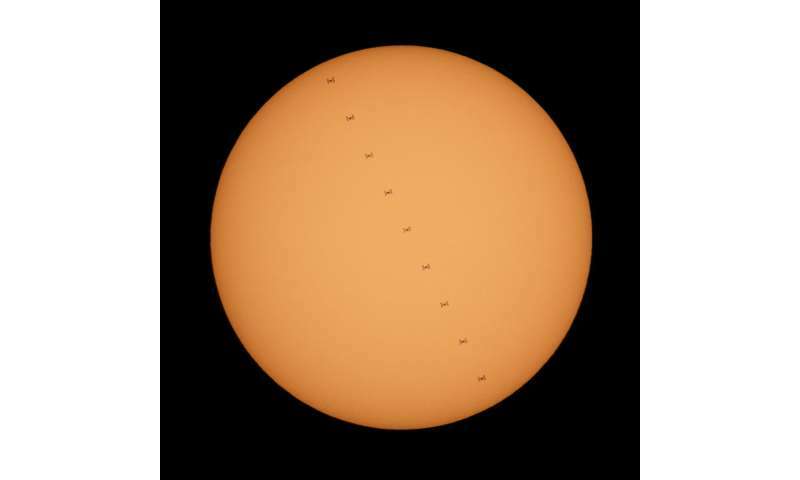 This composite image, made from nine frames, shows the International Space Station, with a crew of three onboard, in silhouette as it transits the Sun at roughly five miles per second, Sunday, Oct. 7, 2018. Onboard are Commander Alexander Gerst of the European Space Agency, Serena Auñón-Chancellor of NASA, and Sergey Prokopyev of Roscosmos. The trio will soon be joined by Nick Hague of NASA and Alexey Ovchinin of Roscosmos, who are scheduled to launch on October 11 from the Baikonur Cosmodrome in Kazakhstan.